Above is a "Zebrafish embryo growing its elaborate sensory nervous system (visualized over 16 hours of development)" captured by Elizabeth Haynes of the University of Wisconsin - Madison, and colleagues. 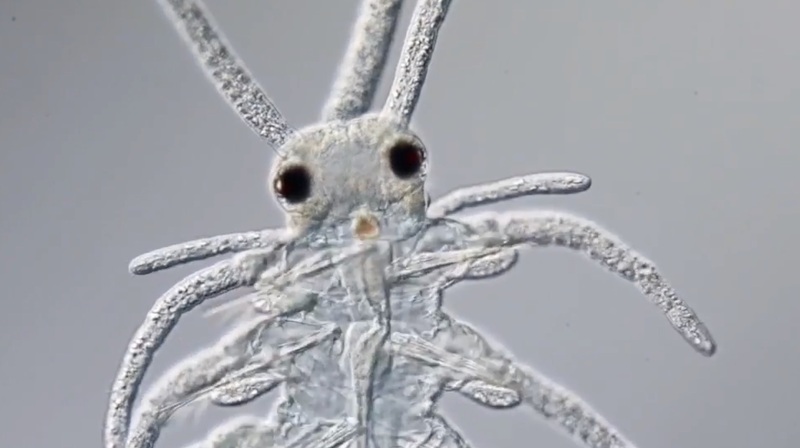 This wondrous clip is the winning entry of Nikon's "Small World in Motion" microscopic video contest revealing dynamic weirdness and beauty at the tiniest scales. Below, second place, Dr. Miguel Bandres and Anatoly Patsyk (Technion - Israel Institute of Technology), "Laser propagating inside a soap membrane;" and third place, "Polychaete worm of the Syllidae family," by Rafael Martín-Ledo of the Conserjería Educación Gobierno de Cantabria. “It’s a bit of a Frankenstein’s monster right now,” says Betzig, who is moving to the University of California, Berkeley, in the fall. His team is working on a next-generation version that should fit on a small desk at a cost within the reach of individual labs. The first such instrument will go to Janelia’s Advanced Imaging Center, where scientists from around the world can apply to use it. Plans that scientists can use to create their own microscopes will also be made freely available. Ultimately, Betzig hopes that the adaptive optical version of the lattice microscope will be commercialized, as was the base lattice instrument before it. That could bring adaptive optics into the mainstream. “If you really want to understand the cell in vivo, and image it with the quality possible in vitro, this is the price of admission,” he says. 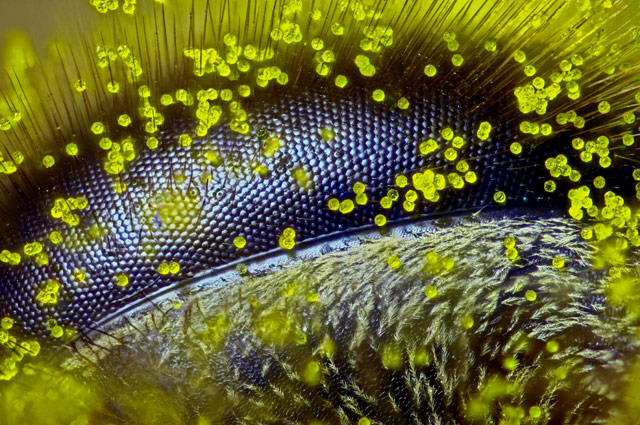 This is the eye of a honey bee peppered with dandelion pollen, magnified at 120x. 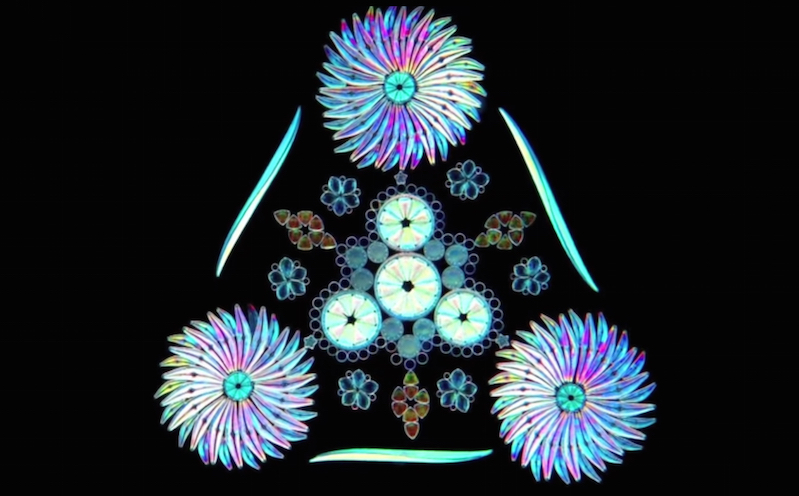 The image, by Ralph Grimm, won Nikon's Small World 2015 Photomicrography Competition. Below, the second, third, fourth, and fifth place winners. Kristen Earle, Gabriel Billings, KC Huang & Justin Sonnenburg's "Mouse colon colonized with human microbiota (63x):"
Dr. Igor Siwanowicz's "Intake of a humped bladderwort (Utricularia gibba), a freshwater carnivorous plant (100x):"
Daniel H. Miller & Ethan S. Sokol's "Lab-grown human mammary gland organoid (100x):"
Dr. Giorgio Seano & Dr. Rakesh J. Jain's "Live imaging of perfused vasculature in a mouse brain with glioblastoma:"
Researchers borrowed optical techniques from astronomy and ophthalmology to dramatically improve imaging of biological samples. 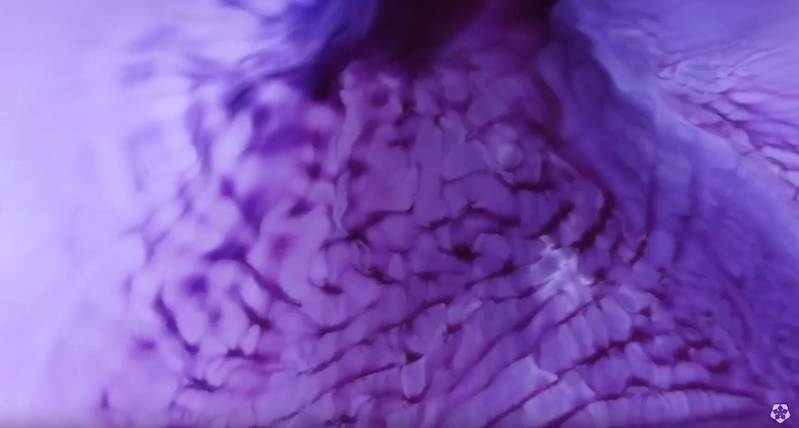 This video, created by scientists at the HHMI Janelia Farm Research Campus, shows neurons in the brain of a living zebrafish embryo. You can see the difference in quality when their new technique of "adaptive optics" is switched on and off. 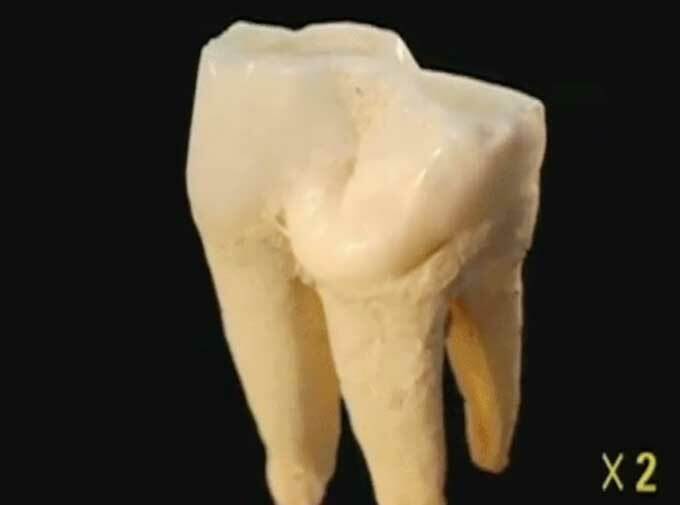 According to physicist/engineer Eric Betzig who led the research, “The results are pretty eye-popping." 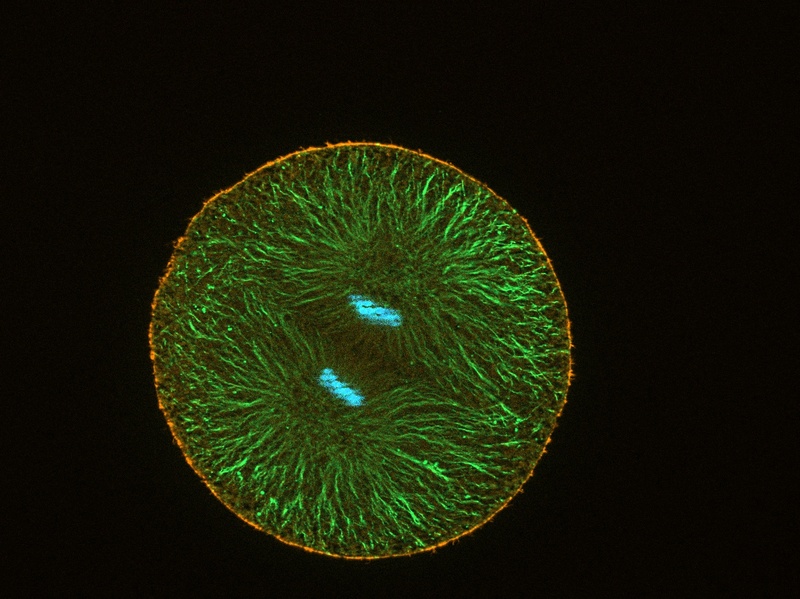 Sea urchin egg undergoing mitosis with fluorescent-tagged/stained DNA (blue), microtubules (green). Cells divide. One single piece of life tugs itself apart and splits in two. It sounds like a purely destructive process, reminiscent of medieval woodcuts where the hands and feet of some unfortunate thief are tied to horses heading in opposite directions. But that's the macro world. On the micro scale, to split is to live. A dividing cell doesn't just rip itself to pieces. Instead, the cell first makes a copy of its genetic information. When the cell splits, what it's really doing is making a new home for that copy to live in. Make enough copies—and enough copies of the copies—and you eventually end up with a living creature. Back in May, I took part in the Marine Biological Laboratory Science Journalism Fellowship, a 10-day program that gives journalists hands-on experience in what it means to be a scientist. The program is split into two tracks. As part of the environmental track, I went to the Harvard Forest, where nature is one giant laboratory. But, at the same time, other journalists were busy in a different sort of lab. That right there is one gorgeous copepod, one of the bigger and more important groups of planktonic crustaceans. It looks huge but is actually tiny; probably 1-2mm. You can see how much richer and more detailed the image is (although the colour is stained flouresence, not natural). 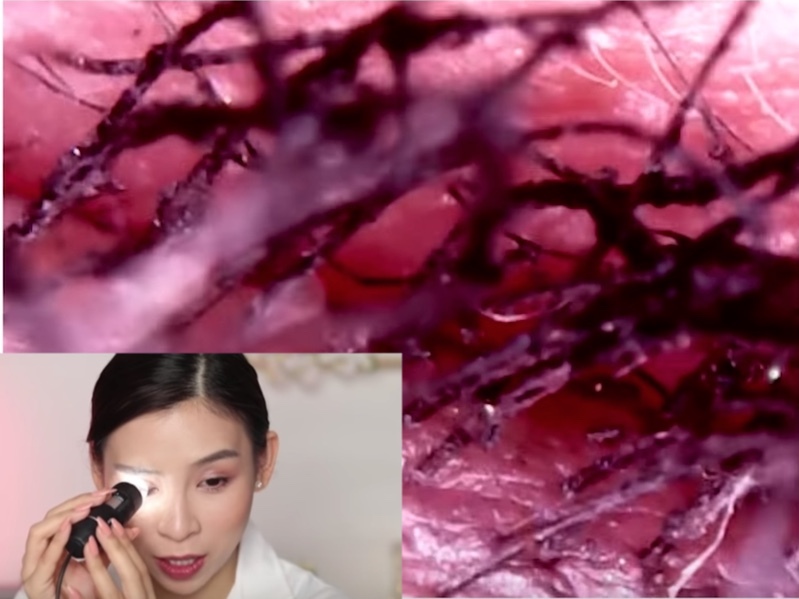 That particular image uses a technique called confocal microscopy, which uses lasers and clever optics to achieve great depth of field (where everything is in focus).